I realize we haven’t even hit Christmas eve yet, but I’m in menu planning overdrive…I think it would be fun to do a family fondue party on New Year’s eve, but having never made it before and suspecting that it can easily turn into a sad greasy mess, I’m a smidge intimidated. And now for you…the hearts of palm salad. My foodie friend Julie passed this recipe on and I make it All. The. Time. It’s really awesome. Mix all of the dressing ingredients together (sometimes I mix in the blender to emulsify a bit) and toss the lettuce with it first then layer the other ingredients on top. I have a cheese fondue recipe for you. It's VERY easy. My husband makes it better than I do because he will sit and stir FOREVER to make the cheese lumps go away. Mix 2 tbsp margarine and 2 tbsp flour and allow to thicken. Add 1 can chicken broth. Allow to thicken again (ours never really "thickens" like the recipe says, so we just make sure it's well mixed.) Add 8 oz cubed cream cheese and 8 oz cubed velvetta cheese. Stir until creamy. Ours bubbles and the trick is stirring it constantly so it doesn't burn to the bottom of the fondue pot. This makes enough for 4 hungry adults, but I'd also say that we definitely overeat when we make it! We serve ours with chunks of bread, roast beef, carrots, little smokies, and whatever else strikes our fancy. You're very welcome! I hope it works for you. J, we do fondue every NYE for 20 friends. Some years we buy the individual cheeses, shred it all, etc. But most years, we just buy the fondue packets - at Trader Joe's and most grocery chains this time of year. They come from Switzerland. We add a little white wine and garlic but that's it. Serve with a salad - nothing could be easier. Just remember to stir in one direction (according to my hubby's swiss mom) and if you drop a piece of bread in the bowl, you have to sing! That salad sounds delicious! Especially since I love hearts of palm and my new year resolution is going to be eat more vegetables! I wish I had something to share. No fondue recipes here, but it sounds like the perfect treat for New Years Eve. OK, this is the recipe for you, promise. Super easy, traditional cheese fondue: Swiss Fondue from Gourmet 1991. Search for it on www.epicurious.com. For some reason I am having trouble inserting the link here. We are thinking of doing fondue for New Year's too! 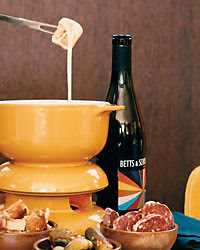 The NYTimes did an article on fondue a while back with an great classic swiss cheese fondue recipe. Shread the cheese in the food processor and it's a piece of cake. Oooh, fondue on New Year's Eve! What an excellent idea! I am going to go home tonight and suggest it to my husband. It'll just be the two of us, but that's okay! There are tons of great and easy recipes out there. The easiest chocolate approach is just good chocolate and cream. The crate & barrel chocolate is pretty yummy. My favorite dippers: Bananas, strawberries, and pound cake. Pineapple is also surprisingly delicious! Yea for Julie...she's one smart cookie! Heard you all had fun on Saturday! Merry Christmas Joslyn! My sisters and I are Swiss and we actually buy the packs! They taste just as good, are easy, and end up being cheaper than buying all the gruyere and ementaller, kirsch, etc. Garlic slices are a must. Thanks for the salad recipe! I don't have a fondue one for you, sorry, but I do have lots of good cheesy vibes for you. New Years already? I am not even prepared for Christmas yet! A fondue party dose sound like a lot of fun though and very delicious. Sorry I do not have any easy fodue recipes. I did fondue last New Years and it was so much fun! I don't have the book in front of me but they sell as special fondue book in William Sonoma--the cheese recipe that they says to pair with asparagus is amazing! Oh, you are making me so incredibly hungry for some right now! YUM - looks very good! OHH YUM!!! I'm officially ready for lunch. We are so lucky to share fondue with you guys NYE! All these recipes look so yummy too!!! 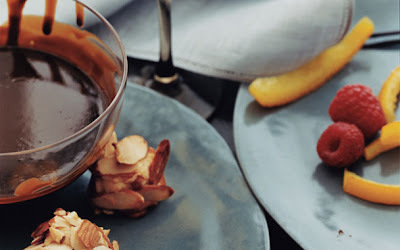 Williams Sonoma has a great fondue recipe...check it out on their site. I think its titled something like "Classic Cheese Fondue". We enjoyed a fondue dinner on Christmas Eve...a tradition in my husband's family. We used Emmentaler, and Gruyere I believe. You'll also need white wine (we used a dealcoholized version but it tastes just about the same). This is the version the French and Swiss use...be wary of any "American" versions with ingredients other than these classics. Also, use an electric fondue pot...it's a lot easier. We cubed artisan country French bread...and it was outstanding. I hope you enjoy a wonderful meal. Fondue is such a great social meal! I made this salad to GREAT acclaim at Christmas. Thanks, Jos! Mmm.. I like the sound of that salad with a cheese fondue. I don't have a pot, but fondue has been really appealing to me lately too!